For weekend retreats. Weddings & romantic escapes. 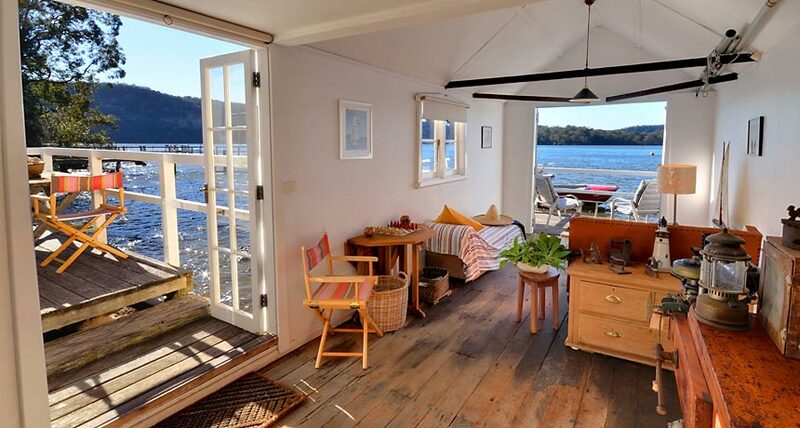 Luxury, cottage-style, holiday accommodation on the Hawkesbury River. Less than 1 hour from Sydney. Beautiful accommodation looking out over breathtaking views of the Hawkesbury river. Perfect for romantic getaways, baby-moons or family retreats. Originally built in the 1920s, this cottage haven has been lovingly restored and is the perfect holiday retreat for up to three couples or a family with children. Enjoy your stay in the intimate Boathouse Studio or enjoy the rooms of the cottage house, with french doors from the main and lounge room opening to a large verandah and capturing the morning light and endless river views. The secluded, tranquil gardens and boatshed right on the water's edge offer complete relaxation and a stunning place to celebrate by the river. The outdoor garden table, studio deck and private boatshed are perfect for afternoon drinks before retreating to the cottage for sunset dining. The gardens have been immaculately kept by the owner, Mary, and the lawn includes a gas barbecue. From time to time, we've even had elopements, family celebrations and intimate weddings here! Located just one hour north of Sydney, NSW Australia. Exclusively accessible only by boat, water taxi or The Riverboat Postman Ferry. Get in touch with us to help plan your stay. Copyright Amaroo Cottage, 2017. Powered by Squarespace.